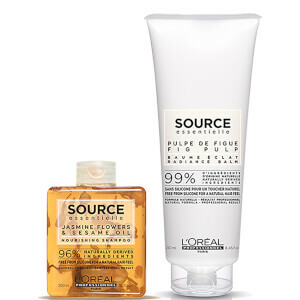 Achieve radiant, healthy hair with the Source Essentielle Nourishing Colour Radiance Duo from L'Oréal Professionnel. The haircare kit combines a replenishing shampoo and a revitalising balm that promise to leave tresses looking vibrant and cared for. 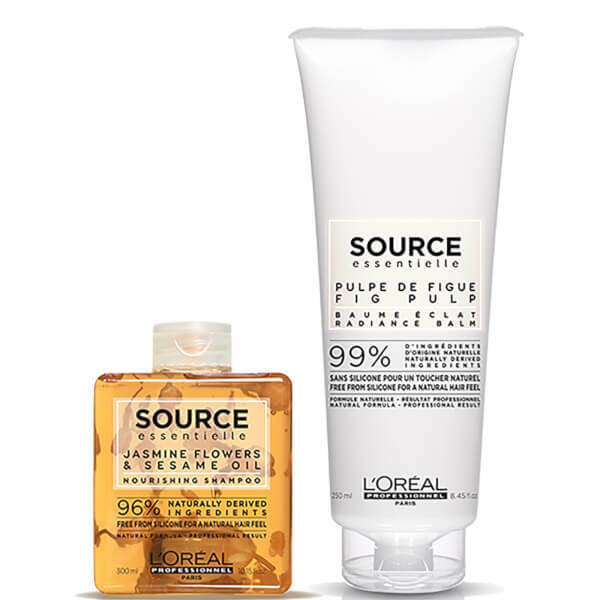 Catering specifically for colour-treated hair, its nourishing blend of Fig Pulp and Sunflower Seed Oil works to soften and condition strands from root to tip. Easy to use, the lightweight treatment helps to minimise breakage, whilst enhancing colour vibrancy and radiance for a salon-worthy finish. Balm: Aqua / Water, Cetearyl Alcohol, Glycerin, Isopropyl Myristate, Stearamidopropyl Dimethylamine, Glycine Soja Oil / Soybean Oil, Helianthus Annuus Seed Oil / Sunflower Seed Oil, Tartaric Acid, Sodium Benzoate, Caprylyl Glycol, Linalool, Ficus Carica Fruit/Leaf Extract - Fig Fruit/Leaf Extract, Xanthan Gum, Potassium Sorbate, Parfum / Fragrance (C219787/1).